'Flash Art Magazine', May/June 1996, p. 85 (illustrated). Exhibition catalogue, No Place Like Home, Minneapolis, Walker Art Center, 1997, p. 73 (illustrated in color). A. Ruiz, et al., exhibition catalogue, Kcho: Todo Cambia, Los Angeles, The Museum of Contemporary Art, 1997 (illustrated in color). Exhibition catalogue, Global Vision: New Art from the 90s, Part I, Athens, 1998, p. 4 (illustrated). Exhibition catalogue, Shortcuts, Nicosia, Nicosia Municipal Arts Centre associated with the Pierides Museum of Contemporary Art, DESTE Foundation and the Laiki Group Cultural Centre, 2001, p. 48 (illustrated). Exhibition catalogue, Sightings, 1999-2001, Torino, Galleria Civica d'Arte Moderna e Contemporanea, 2001, no. 27 (illustrated in color). New York, Barbara Gladstone Gallery, Kcho, 1996. Minneapolis, Walker Art Center, No Place Like Home, March- June 1997. New Mexico, SITE Sante Fe, TRUCE: Echoes of Art in an Age of Endless Conclusions, July- October 1997. Athens, DESTE Foundation for Contemporary Art, Global Vision: New Art from the 90's, Part I, May- June 1998. This colossal sculpture by KCHO makes reference to a number of monuments in the history of art, as well as to the crossing of the tumultuous waters between Havana and the coast of Florida. The iconographic form of the balsa, the homemade boats and rafts used by Cuban refugees to leave their homeland, is abundant throughout the artist's body of work. While this is a common image seen in Cuban and Cuban-American art, KCHO's work has made the balsa into a monument laden with meaning. Born in Havana, KCHO was educated at the Escuela de Bellas Artes. Since winning the prize at South Korea's Kwangju Biennial in 1995, the artist has become an important figure in the world of contemporary art. This work, part of a pair of tower-like structures titled La columna infinita I and II, was exhibited at Barbara Gladstone Gallery in June 1996 as part of a larger exhibition in which the artist showed a selection of older works. La columna infinita refers in its title to an influential work by Constantin Brancusi (1876-1957). His Endless Column, the earliest version of which dates to 1918 and is in the collection of the Museum of Modern Art, is a reference to the skyscraper-laden landscape that he encountered in New York upon his arrival. Also fashioned from wood, Brancusi's pivotal work made reference to ceaselessness by stacking identical rhomboid shapes atop one another, giving the effect of endless movement. Significantly, however, the form of this sculpture makes a much more direct reference to Vladimir Tatlin's project for a Monument for the Third Communist International. Tatlin (1885-1953) created the proposal for his monument in 1919 and it became an icon for avant-garde Russian architecture and Communist ideals. His work eventually informed the development of Constructivism, particularly in architectural design. Though not fashioned specifically in a spiral form, KCHO's work nevertheless makes a clever reference to Tatlin's giant spiral column created from long pieces of wood. In KCHO's work, each of eight separate balsa forms of graduating sizes are placed at distinct angles to create the illusion of an endless, rotating spiral column. The reference to Brancusi's work cements the idea that the balsas are part of a constant and endless flow of people. 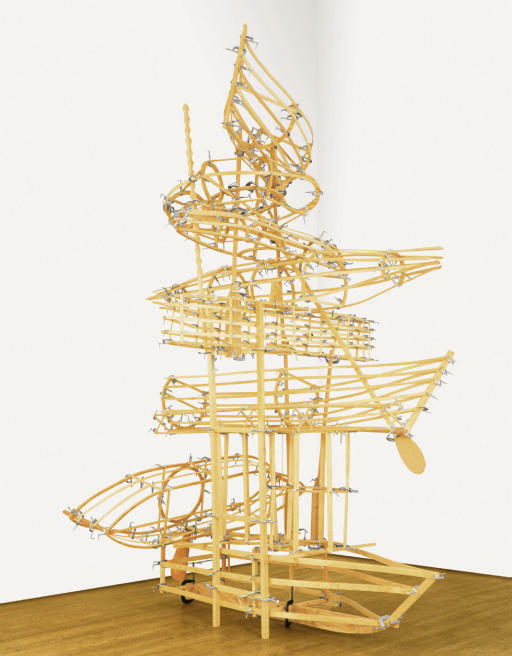 The reference to Tatlin's work invokes the idea that Communism, as a powerful global movement, deeply marked the history of Cuba and its people and influenced their subsequent movement across water. In discussing a drawing in the MoMA collection that also refers to Tatlin's monument, the artist described the Tatlin-like form as a metaphor for Cuba, which he saw as a skeleton of a utopia [A los ojos de la historia, 1992-95, watercolor and charcoal on paper, 60 x 49¼ in. (152.4 x 125.1 cm.). Purchased with funds given by Patricia and Morris Orden.]. Ultimately, the sculpture functions as an homage to the history of modernism and to the ideals of early modernists who were deeply influenced by politics and social issues as well as by aesthetics.